The porch on the front of the house was not originally enclosed. It doesn’t have a basement under it (who knows how it is supported), and it has sagged and settled over the years. 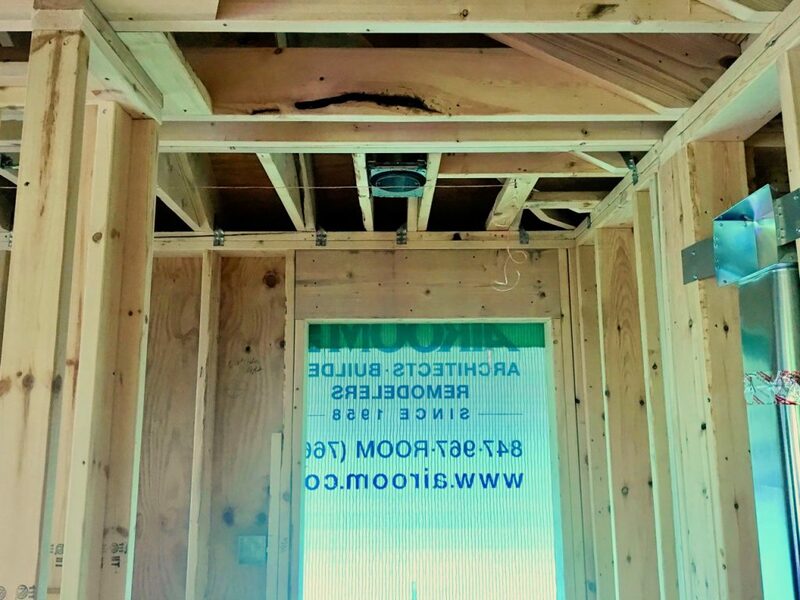 Its roof sank in the middle, causing the internal gutter to pitch backwards. Little rain reached the downspout at the very front of the roof, and during heavy rains, most water overflowed onto our heads as we walked up the sidewalk to the front door. 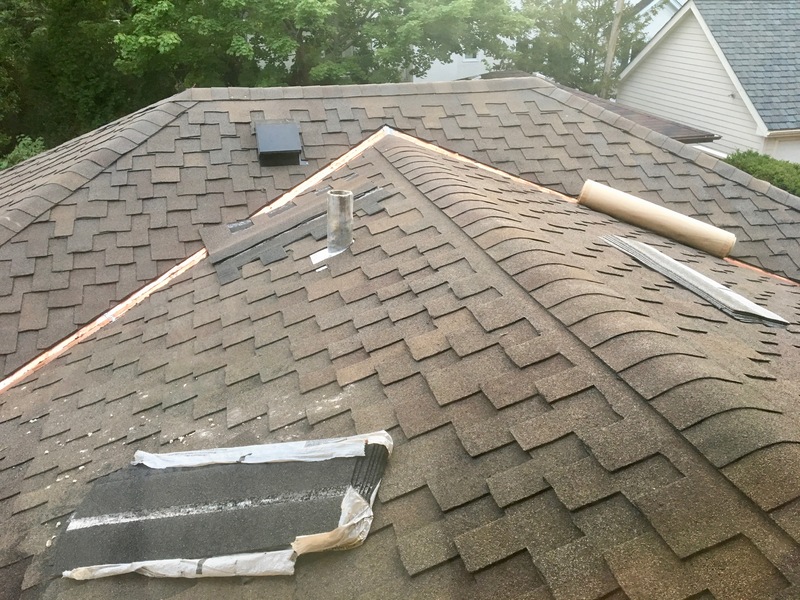 I had walked on the roof several times to clear out gutters and downspouts and inspect the second floor gutter, and noticed that the roof felt rather spongy in places, so I was expecting this to be a major job. 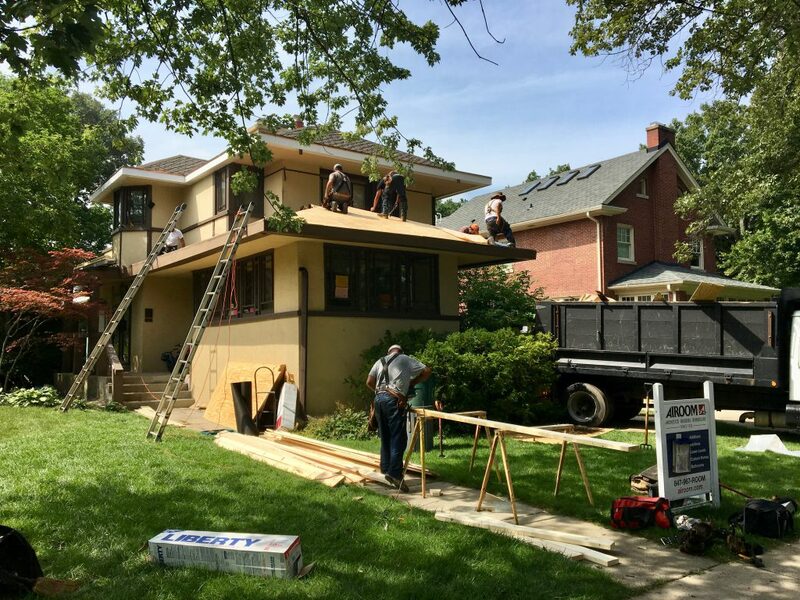 Our objective for the porch was to repair the damaged spots and cosmetically fix the roof to create a straighter appearance. Ideally, we would also pitch the roof for a sensible downspout location. 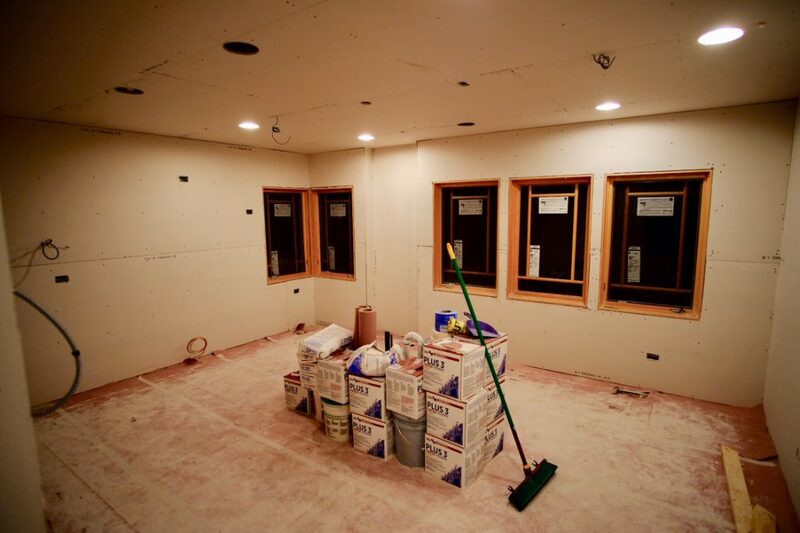 After looking at bare framing for months, it is a dramatic change to see the walls finally insulated and covered with drywall! 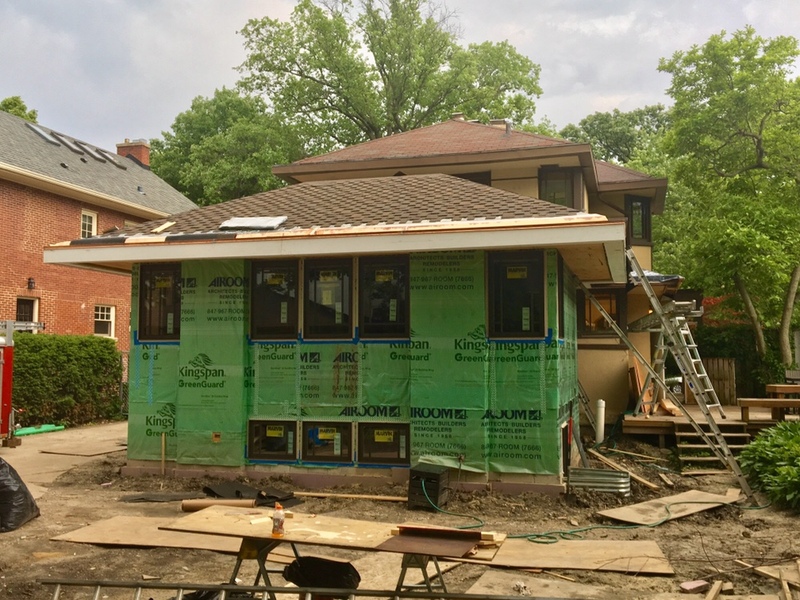 The roof and gutters for the second floor are now complete, which leaves only the roof and gutters for the front porch, and downspouts. The roofing for the addition is finally complete. Well, almost. Here’s a photo from a few days ago that shows the shingles are complete. 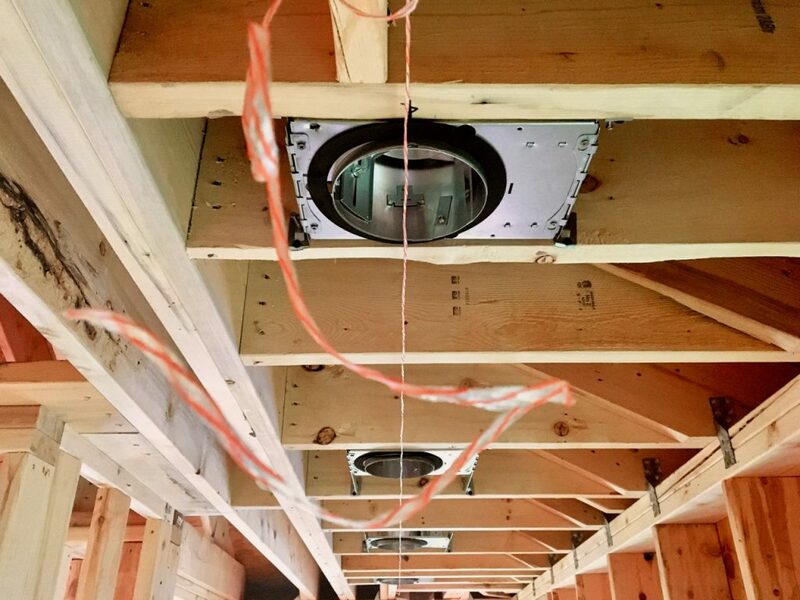 The lead vent pipe flashing and the kitchen exhaust vent are also installed. Today was an exciting day. Our custom Marvin windows arrived and were installed. Author BenPosted on June 18, 2018 September 23, 2018 Categories UncategorizedTags windows2 Comments on Windows have arrived! How much water can a sump pump pump? Water continues to be our enemy. 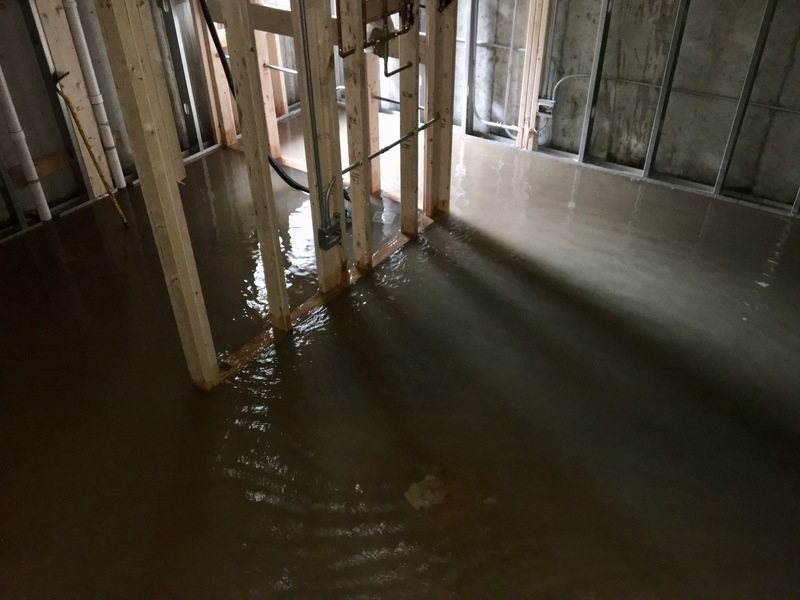 The new basement has flooded twice more since the original flood. After re-routing the sump pump into the existing discharge pipe, our front yard has become a swamp. 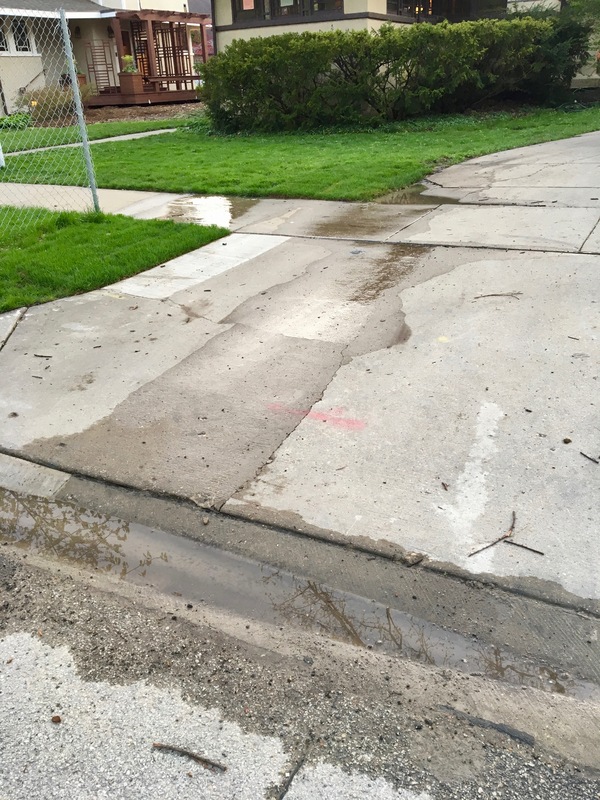 Water constantly drains into the street from our discharge. Author BenPosted on May 25, 2018 September 23, 2018 Categories UncategorizedTags ejector pit, flood, sump pump, window wellLeave a comment on How much water can a sump pump pump? Work had been progressing at a good pace. 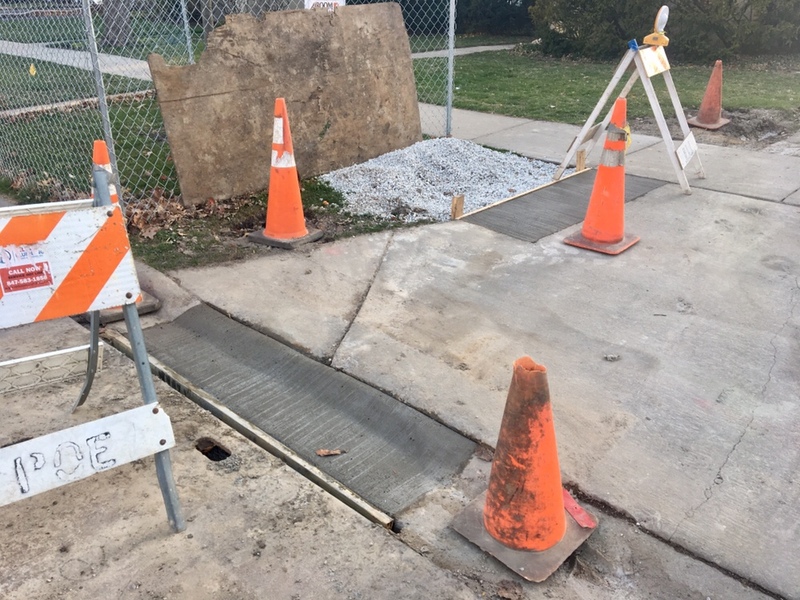 The street, driveway, and yard were patched and repaired after the water service was upgraded. Author BenPosted on May 11, 2018 September 23, 2018 Categories UncategorizedTags concrete, electrical, flood, hot water heater, plumbing, shingles, stairs, tree, water serviceLeave a comment on Two steps back? This morning, I met with our contractor and electrician to finalize the placement of can lights, switches, and outlets. We had done all of this in detail in the blueprint phase, which was an incredibly helpful process, but there are always a few tweaks. Can lights in the mud room are perfectly aligned. 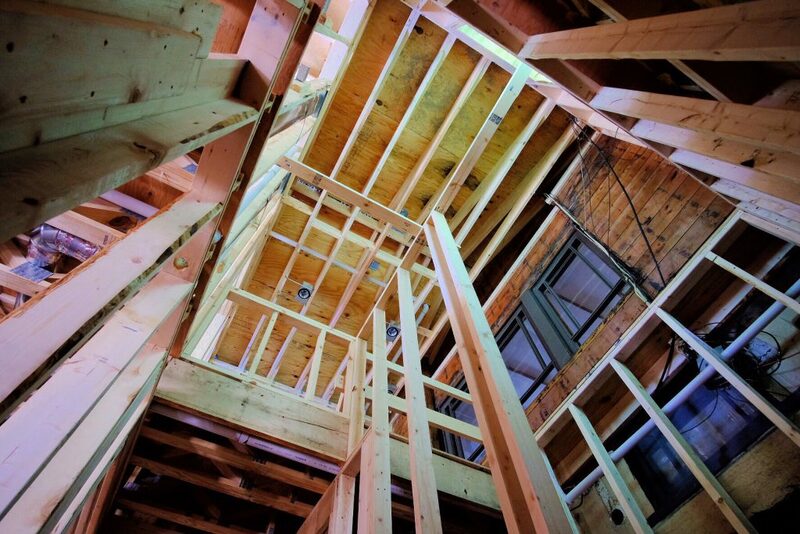 One of the things I’ve realized is that internal structure (framing, joists, ductwork, etc.) can obstruct ideal placement. This can light under our back door isn’t quite centered due to the ceiling construction. The carpenters returned last week and have virtually completed the basement framing work. The plumbing rough-in is also nearly complete. Electrical work should begin next week. View up from the new basement. Photo taken from what will be the staircase. The stucco has been removed from the former outside wall of our house. This week, I feel like the details of this project are starting to get away from me. I’m very particular about things, so it is frustrating to see errors and have to deal with them (or learn to accept them). 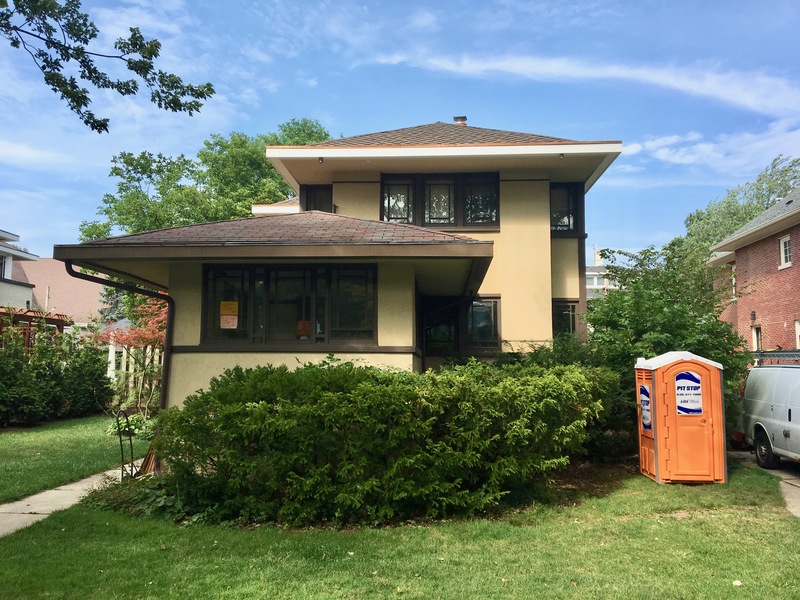 I’ve looked at many houses over the years, and know a good renovation from a sloppy one. Since starting the project, I’ve been determined to do everything I can to make sure this is a good one. That means all the details must be handled just right.